Our program is USTA certified, and one of the first to offer classes on a 20ft by 20 ft court with tennis equipment specifically designed for children. TennisKids provides the court, racquets, balls, and other course materials. All your child needs to bring is a pair of comfortable running shoes and a cute little smile! On-Campus Program – TennisKids classes are always on school grounds, maintaining your child’s safety and security. Smaller Class Sizes – Keeps kids focused with a 6-to-1 Student to Instructor Ratio. Dedicated Instructors – Ensures greater familiarity and comfort for the kids. Montessori-Based Curriculum - The TennisKids lesson plan promotes individualized learning and utilizes the three-period lesson, maintaining consistency with the Montessori philosophy. Tennis Education – The TennisKids program covers tennis safety, terminology, positioning, grips, and strokes through a variety of fun activities. Progress Reporting – TennisKids Instructors evaluate each child individually. Results are recorded electronically and presented with a certificate and tennis grip! 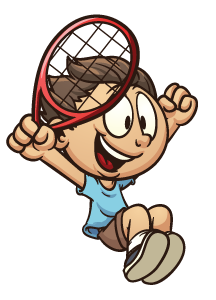 Session Schedule – TennisKids offers three 10-week sessions during the school year. Each session is comprised of ten weekly 30-minute classes. Many schools offer a summer session as well! We bring Montessori principals to the tennis court with various games and materials that will reinforce each weekly lesson. Our goal is promote social skills, sportsmanship, and motor development skills. It also provides an opportunity for the kids to build self-confidence, self-esteem, and a positive self-image.